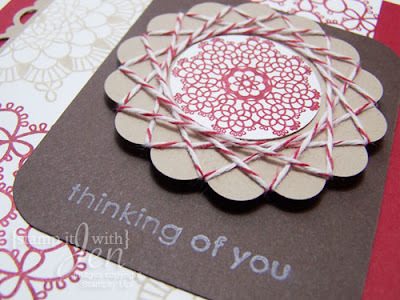 stamp it with Jen: string and doilies! How cool is this? Doesn't it remind you of that game spiro-graph? This set, Delicate Doilies, reminds me of that game! I loved it when I was a kid! To make the cool embellishment, I stamped the smaller doily in cherry cobbler and attached it to a scallop punch circle. Then I started wrapping bakers twine around between the scallops! Click here to order Stampin' Up Products Online from me! Lovely card. Very creative idea with the baker's twine. Growing up I LOVED my Spirograph, so maybe that's why I love this set so much. What you did with the baker's twine is super duper awesome! I love it, love it, LOVE IT! I am a Stamping addict and co-owner of Newton's Nook Designs! I love to make cards, gifts and other stamped items. I also dabble a bit in scrapbooking, usually pictures of my two adorable kitties! Recieve e-mails when I add new posts to my blog! Sign up to get my monthly e-newsletter! All contents (not limited but including photographs, text and desciptions, and design work) is ©Jennifer Jackson. My original artwork is for personal inspiration only and may not be copied for publications, contest submissions, or monetary gain. Flowers from the Berry set!